EXISTENCE OF POSITIVE SOLUTIONS TO BOUNDARY VALUE PROBLEM FOR ONE-DIMENSIONAL p-LAPLACIAN Yujun Cui;Shu Zhang;Dept.of Math. 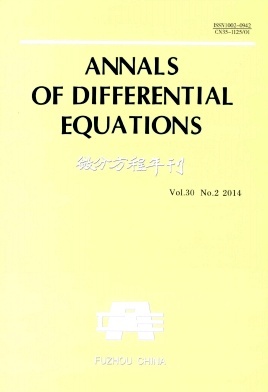 LIMIT CYCLES BIFURCATION FOR A CLASS OF DEGENERATE SINGULARITY Xianping He;Jingjing Feng;Qinlong Wang;School of Information and Math. EXTINCTION AND PERMANENCE OF TWO COMPETING SPECIES WITH IMPULSES Jianhua Shen;Guochun Ma;Weibing Wang;Dept.of Math. BIFURCATION ANALYSIS IN A GENERALIZED FRICTION MODEL WITH TIME-DELAYED FEEDBACK Chuang Xu;Junjie Wei;Dept.of Math. A RESEARCH ON PHASE SYNCHRONIZATION FOR EXTENDED KURAMOTO MODEL Jianhua Xu;Changling Han;Dept.of Math. THREE POSITIVE SOLUTIONS TO BVP FOR p-LAPLACIAN IMPULSIVE FUNCTIONAL DYNAMIC EQUATIONS ON A TIME SCALE Zhiyu Zhang;Lijian Yin;Dept.of Math. STABILITY IN LAGRANGE SENSE FOR A CLASS OF STOCHASTIC STATIC NEURAL NETWORKS WITH MIXED TIME DELAYS Jili Wang;Linshan Wang;Dept.of Math.